Welcome to the Randolph Technical Career Center! We're glad you're here. Don't forget to visit our News & Updates page for more happenings at RTCC; And check out this great website about Tech Centers across Vermont! 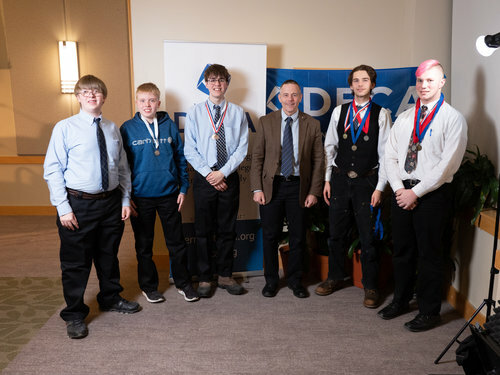 Students from RTCC have actively participated in the Vermont State Distributive Education Clubs of America (DECA) conference at the University of Vermont for years, and year after year, they continue to shine. DECA is an international organization devoted to preparing high school students for marketing, finance, hospitality and management careers. During the 2017 and 2018 DECA competitions, RTCC students finished in first place in Vermont in the Principles of Business Management/Administration and Personal Financial Literacy categories. This year, RTCC students finished in first and second place in Vermont in the Accounting Applications competition; and they took third place in the Principles of Business Management/Administration category, and in a role-play scenario. Once again, RTCC students achieved outstanding results during the state competition, earning the privilege to represent Vermont during the upcoming DECA International Career Development Conference (ICDC) in Orlando, Florida. 1st Place - Overall Accounting Applications; 1st Place - Accounting Applications Role Play One; 2nd Place - Accounting Applications Role Play Two; 1st Place - Accounting Applications Exam; $2,000 Vermont Technical College Scholarship. 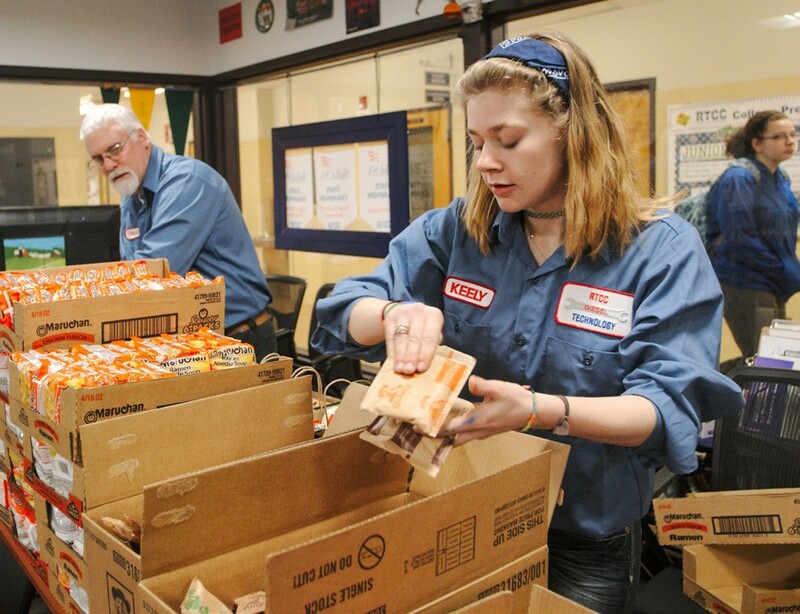 Friday morning at Randolph Technical Career Center was a mad dash to assemble 160 identical bags, each containing a box of pasta, packets of oatmeal, canned goods, and several other grocery items. When students returned from lunch, a bag was waiting on each and every desk—no exceptions. Food for Thought, the program behind these deliveries, is the brainchild of RTCC staff members Colin Andrzejczyk and Jason Finley. Finley is the school’s work-based learning coordinator and helps students find internships to supplement their classroom education. “We’re talking about thriving, and they’re thinking about surviving,” Andrzejczyk, the student assistant counselor, said. “Learning is much harder on an empty stomach,” he added. In the Orange Southwest Supervisory District, to which RTCC belongs, about 40% of students receive free or reduced-price lunch. That figure does not include the many eligible students who do not fill out the required paperwork for a variety of reasons, such as pride, noted Finley. The two adults, who both work with the entire school population, asked themselves what they could do to “show students that the tech center cares about them in another way,” Andrzejczyk said. With each student receiving a bag, regardless of family income and access to nutrition, Food for Thought hopes to de-stigmatize food donations. Some students at RTCC may never experience food insecurity, and Food for Thought serves as “a way to expose them to a reality that’s happening in their communities,” Finley pointed out. Food for Thought is now in its ninth month, and students have come to expect the deliveries on the last Friday of every month, Finley said. Although staff members direct the program, RTCC students have also stepped in to support the initiative. Food for Thought’s founders described the process of funding and packing grocery bags for all of their students as a “scramble”—a feeling many students and their parents know first-hand. Some families have even called Andrzejczyk and Finley to ask if there was extra food available. “If you feel like you need this, you should take this,” Finley said. Monetary donations may be sent to RTCC Food for Thought, 17 Forest Street, Randolph, Vt. 05060. A handful of RTCC’s environmental resource management students started their chainsaws behind WRVSU’s Bethel campus on Monday afternoon for a friendly competition in the Game of Logging—a hands-on method of learning safe tree-felling techniques in complex situations. In the photo to the right, Dave Birdsall, an instructor at Northeast Woodland Training Inc, reviews safe tree felling practices with the students. Each student was scored on their ability to accurately fell, limb, and buck trees as well as their adherence to logging safety standards. Throughout the demonstration, students were reminded of classroom lessons by RTCC instructor Max Van Hauten, who provided additional insight into the nuances of methods such as the axl cuts and chainsaw technique. “This one’s coming back with us!” said Van Hauten after observing a particularly well-executed axl loc. Amid the fun, Van Hauten reminded his students that—as entertaining as the demonstration was—each advanced cut was meant to keep them safe in the woods. 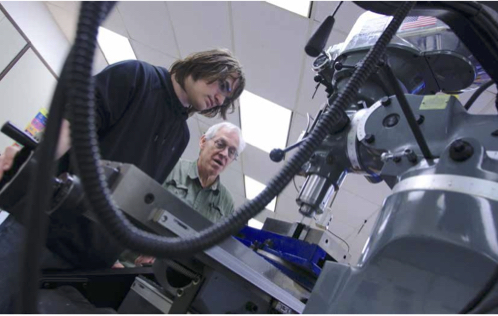 Students at Randolph Technical Career Center (RTCC) will now have the opportunity to launch themselves on a much-needed career pathway as a variety of employers and organizations work to close a “skills gap” in the labor force. With the hope of creating a new generation of highly-skilled and technically savvy workers, RTCC’s new program—Advanced Manufacturing—introduces students to STEM-related skills such as machining, welding, fabrication, 3D printing, and robotics. The goal, according to instructor Kevin O’Connell, is to build a foundation of experience and understanding for students interested in pursuing careers in the manufacturing industry. “For our society, I think it’s important to understand that we make things,” said O’Connell on Monday morning. “Things just don’t happen and not everything can just be done like that,” he said with a snap of his fingers. Manufacturing has evolved so much in recent years that incoming workers must now be equipped with a much wider range of skills than what was needed just a generation ago, said O’Connell as he ticked off what a new manufacturing worker needs to know. “A mechanic on the floor now— instead of just turning a wrench and changing some parts once in a while—now has to know about hydraulics and pneumatics, he has to know about programmable logic controllers (PLCs), he has to be able to interface with a computer,” he said. Describing his educational approach as “foundational,” O’Connell likens the new Advanced Manufacturing curriculum to the Athenian Parthenon, which begins with a broad base of understanding that supports individual columns or, in this metaphor, individual specialities available for students to explore. Among the most critical of those foundational skills is a working understanding of computer assisted design (CAD) programs such as SolidWorks, which is capable of virtually modeling a sketch of nearly any individual part before outputting the design to a milling machine, laser cutter, or even a 3D printer. Armed with this blend of traditional and emerging skill sets, workers entering the field of manufacturing and fabrication—sometimes referred to as the “new collar” economy—are in remarkably high demand. According to the National Association of Manufacturing (NAM), the U.S. in on track to witness more than 2.7 million baby boomer retirements by 2025. This, combined with an expected need of roughly 3.5 million manufacturing positions has put the proverbial screws to employers who, according to the NAM, are expecting to leave as many as 2 million advanced manufacturing positions unfilled due to under-skilled workers. “One of the biggest contributors [to the skills gap] is that the workforce that has traditionally gone towards these trades is now rapidly approaching or has surpassed retirement age,” said Christopher Gray, an assistant professor of manufacturing and mechanical engineering at Vermont Technical College (VTC), which serves as a community partner with RTCC. “If you went into any manufacturer today—even some small ones—they would tell you that in their tool rooms and on their manufacturing line—they’re basically begging people to stay when they’re long past retirement age, because they don’t have anybody to fill those positions,” he said. Noting that there are roughly 1,000 manufacturing and fabrication positions available at about 960 Vermont employers, Gray asserted the national narrative was playing out at a local level as well. “On a basic, one-to-one scale, every manufacturer in the state has at least one job opening right now and there aren’t programs or people equipped to fill those positions,” he said. Those manufacturing careers— welder, machinist, electrician, engineer— often carry robust salaries ranging between $35,000–$40,000 per year depending on location and experience according to the Bureau of Labor Statistics. With a starting wage of at least $15 per hour, RTCC senior Joseph Pregent is optimistic about his future as a welder. Already granted a scholarship at the Advanced Welding Institute, Pregent hopes to eventually use his emerging welding expertise to help rebuild California homes destroyed by recent wildfires— that is, once he’s finished figuring out the various nuances of the CAD assignments from instructor O’Connell. Ever Wonder What Digital Film Students Do? Well...when they're not winning the Gold Medal at Skills USA, they're producing some very cool films...like this one (for which they won a Gold Medal at Skills USA!) Watch the video here. In the mood to watch videos? Then you have to see this short film showing our Building Trades tudents finishing up their furniture projects. We call this real learning, from real craftspeople, with real results. Watch the video here. Students in RTCC’s Environmental Resource Management (ERM) program participated in the Game of Logging tree-felling competition hosted by Northeast Woodland Training at the Southwest Vermont Career Development Center in Bennington this May. Students from tech centers across the state to compete in this event, with only the top ten going on to the final round - tree felling. Students are then judged on their felling plan, safety, accuracy, and timeliness. ERM student Gabe Howe placed 6th overall, landing into the final bracket. After felling his tree, he finished in 5th place. Congratulations Gabe! Meet our Director, Jason Gingold. Sure, he's proud of our new sign, but he's even more proud of our programs...read all about them - and us - by visiting some of our pages! We're glad you're taking a few minutes to check out web site. We hope you'll like what you see, and that you'll schedule a time to come visit, or maybe even shadow us for a day. Our students love what they do -- and are doing what they love -- all while preparing for careers in their chosen field; for college; or for service in the US military. If you're ready to wake up in the morning and love coming to school, you owe it to yourself to learn more about RTCC. We look forward to seeing you soon.